When disaster strikes, it’s important to stand tall and take action! Green waste in yards and gardens after a natural disaster can be dealt with fast and effectively with the right means of assistance. Step outside and take a look at your surroundings. If you’ve stepped into your backyard, chances are you’re amidst green waste. Green waste is essentially any garden waste (hedge trimmings, grass, compost), anything biodegradable, or any plant life. Everyday garden maintenance can produce a lot more green waste than we realise, and it can sometimes require professional assistance. 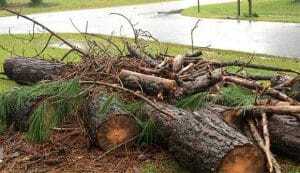 In the unfortunate event of a natural disaster, green waste in Brisbane homes can increase immensely. The aftermath is often overwhelming, and dealing with green waste (such as fallen trees or branches) on your own can be tough. Just as you’d de-clutter your home, it’s important to de-clutter your backyard and outdoor areas. A build up of green waste can pose a hazard to you or your family. Australia is home to some wonderful animals, however some are very dangerous and we don’t particularly want them to become the new roommate. Protect your family from snakes, and other animals that are often found amongst green waste in homes by removing it! By implementing green waste removal, you’re creating an outdoor space to be enjoyed by the entire family. Children will feel encouraged to play outside, and you’ll be more inclined to relax and distress in the comfort of your own backyard. Ok, let’s get it out of here! Are you eager to get started on your yard clean up, but you’re unsure on the first steps to take? That’s where Steve’s Rubbish Removals steps in! We’ll remove the unwanted rubbish and can even lend a helping hand in pruning, tree removal and demolition. Get the ball rolling on for your rubbish removal in Brisbane and enjoy your entire home for what it’s worth!